Tagged under Atsushi Okubo, BONES, Series. I am currently finished watching the show, and I loved it!! I am also reading the manga as it is released. I also plan to buy the full box set(all the episodes in one box set, since there aren't enough episodes in the boxsets they are releasing now for it to seem worth buying to me.) whenever it's released. 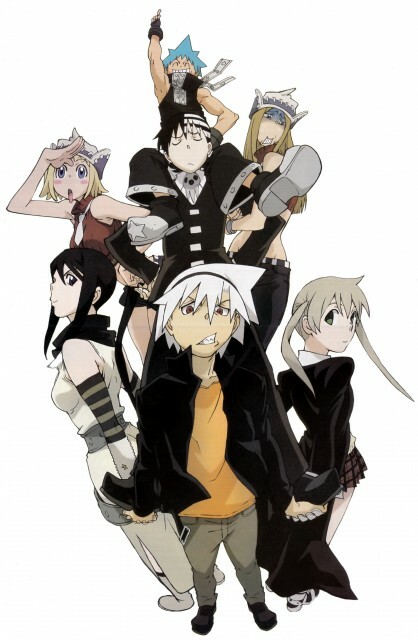 My favorite characters are Maka, Soul, Death the Kid, since he is very funny and never fails to make me laugh, and Black Star; even though his does act pretty stupid a lot of the time and sometimes says pretty mean things to Maka unnecessarily on some level I like him. I even like Patty because she's so childish. I like Stein because of the way he fights. I give it a 10 because I thought it was nicely done and different from most anime that you see nowadays. Though I do wish the anime followed the manga faithfully instead of changing things around seemingly just to fit with a 'happy' ending and give you a sense of 'finality'. Even though for me there was no such thing in the ending because Medusa isn't even dead yet. With that said, I hope the staff give the manga time to get really far ahead and figure out a way to make a second season and follow the manga this time. On that subject, I think that can be easily done, considering this is the same situation as FMA Brotherhood, and somewhat Darker Than Black. I think it can be done; since it already has been with the aforementioned anime; mainly Brotherhood and others,(can't think of any others right now because Brotherhood is the only anime that I've seen recently that has done this and really stands out in my mind.) and I REALLY REALLY hope this turns out to be the case with Soul Eater and we get to see a second season eventually. The first few episodes were hilarious and I loved the animation and the slapstick humour had me in laughing fits. However, watching more and more of the anime, this feeling started to fade and I got bored of it after a while. I feel that this anime series was my style than actual substance. This anime is also cool, plus it very funny sometimes.. This anime also have some resemblance to bleach although I do not know which of which comes first. Very cool characters the background matches the cartoonic style of it and the fighting scenes is also great. The style is nice and Death the Kid is awesome, nice background music also.. the plot is also great.. Very awesome series. Nice anime overall. What I liked the most about this anime was the artwork, very close to the original which is very different than most shounen. The story is enjoyable enough to make you finish the series but I think they could have continued it. This anime is soooo hillarious!! I laugh and laugh in 3 first episodes! It's about a Master n their weapon. The weapon is just look like human if they didnt transform. They also can talk n feel like human do. 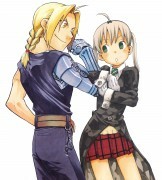 The main character is a girl named Maka. But she is really strong, with his Scythe, Soul. Also the loudmouth boy Black Star, with his big shuriken, Tsubaki (she can transform into so many ninja's weapon), and Death the Kid - the Shininigami's son. His weapon is Thompson Sisters as his twin guns. Of course its not just them. There are also other Master n Weapons in the academy (yes, academy). The artwork isn't bad, but not very good either. But the stories are awesome. Very funny, the battle scenes also great. This series has perhaps the greatest animations I have seen in any anime. I live the art style, and the dub voice acting is very well done (with the exception of Black Star). This is one of my favorites. The wiches or evil guys that trie to destroy the town or kill inocent people so they can eat their soul. It has alot of action but it is especially FUNNY LIKE HELL! I think i laughed so much i almost cried ! 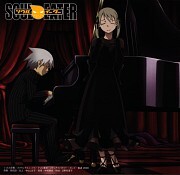 My fav characters besides the main ones (Soul and Maka) is Black Star and Death the Kid they are hilarious! Black Star is too loud-mouthed for an assassin, preferring to make a flashy entrance rather than sneaking up on his opponents! He wants to surpass God! Death the kid is the son of Lord Death (that looks like an airballon clown) he is perfect at everything he does but he has this obsessive-compulsive disorder for symmetry! He views anything perfectly balanced on the right and left to be beautiful, and breaks down when he sees anything off even by the slightest milimiter! ((+/-)) Ahora que me puse al día con el manga, puedo decir que aunque el final del anime esta muy bien hecho con respecto al manga que aun no esta terminado. Sin embargo la historia en el manga es mas llevadera, atrapante y apacionada. Very simple art, yet fitting to the anime, good animations and nice plot. The characters, even the secondary ones, are unforgettable! Dynamic fights, without so much blood, and lots of laughs. I didn't really like the endings, but the soundtracks are ok. In the second part (from about the twenty-fifth episode onwards) everything become slower and the entertainment falls down to a very disappointing end. CRONA: "Having faith in other people? Trusting someone not to hurt you? How idiotic is that?"